Mine: On of the best musicals ever. Great performance by Gene. Good from the beginning to end. Leonard Maltin/Plot synopsis: Joyous, original musical built around Gershwin score; dazzling in color. Plot of artist Kelly torn between gamine Caron and wealthy Foch is creaky, but the songs, dances, production are superb. Oscars include Best Picture, Story and Screenplay (Alan Jay Lerner), Cinematography (Alfred Gilks and John Alton), Scoring (Johnny Green and Saul Chaplin), Art Direction, Costume Design, and a special citation to Kelly. Look fast for Noel Neill as an art student. (out of 5 stars) The dancing makes this one. I love it. 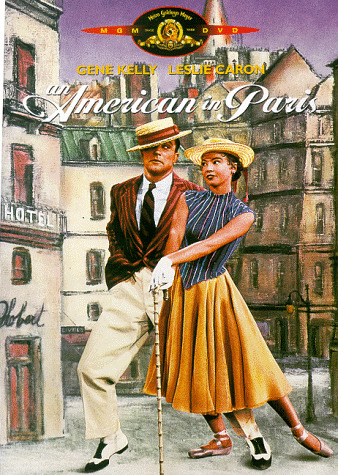 Leslie Caron was a talented ballerina turned actress, and Kelly is ALWAYS watchable.